After a few weeks of re-runs, Nashville fans finally get some new material. After news of her divorce from Teddy hits headlines, Rayna agrees to a sit-down interview with Katie Couric on her show Katie. Rayna and Teddy try to come to terms with parental arrangements for their two children, and decide to the (odd) arrangement of having each parent live at their home for a week or so, so that the children can stay in one place and not be shuttled from place to place. The toll of the divorce is already showing in older daughter Maddie, whose grief is causing her to act out. In Atlanta, Dominic plays a new mix of “Keep Asking Why” and decides that Avery’s new sound will stay and that there will be no discussion about it, Avery finally musters the courage to steal his sound back–literally. He steals the masters from the recording studio and burns them, which leads to an explosive argument between, Avery, Dominic and Marilyn. Avery turns his back on both of them. Scarlett returns home to find that Gunner is drinking heavily, still grieving the death of his brother. After Gunner discovers that the detective who is supposedly working hard to find who killed Gunner’s brother doesn’t seem to care about the case, he tries to take matters into his own hands. Unfortunately, his heroic-yet-naive efforts are ill-timed, as he abandons Scarlett on the day of their audition for Rayna James’ new label. O’Connor ends up doing the audition solo, performing the song “Looking For A Place To Shine.” Afterward, O’Connor and her uncle Deacon figure out that Gunner has gone to a bar in a seedy part of town in order to avenge his brother. They track him down in time to prevent him from getting into harm. Later that evening, the real consequences of Gunner’s actions are revealed when O’Connor gets a phone call saying they want to sign her as a solo artist. Juliette’s determination to keep control of her own career leads to disaster when what was supposed to be a private fan club event turns into a public event after the singer tweets the time and location (Nashville’s Two Old Hippies) to all of her fans. Meanwhile, Rayna cut Scarlett’s audition a bit short when she received a phone call that her daughter Maddie was at said Juliette show. The massive crowd storms the building after seeing Juliette’s tweet. At first, while Juliette sings “Hypnotizing,” the crowd seems content and in calm, eventually, though, they rush the stage, knocking over shelves and other items in Two Old Hippies. One of the shelves falls on top of Maddie. Fortunately, Deacon saves the day. Once Rayna finds out why Maddie is hurt–and that Maddie lied to Teddy about her whereabouts so she could attend the show–Rayna’s frustration comes to a boiling point when she speaks with Juliette. Rayna tells the younger singer bluntly that she needs to grow up and realize that her actions are hurting other people. Rayna later surprises Maddie back home with a present—Rayna’s first guitar. She tells her daughter that she understands the hurt and confusion she is going through and that she’ll need an outlet for it. Meanwhile, Juliette’s present to Deacon–a puppy–is the catalyst for newfound love (or lust) when Deacon finds himself attracted to Stacey, a pretty veterinarian. Avery makes his way back to Nashville, where he gets a performance slot at the Bluebird Cafe. Away from the Dominic-controlled, overly-processed music, he performs “Let There Be Lonely,” with only a piano for accompaniment. Juliette, who is still in counseling with her mother, eventually accepts Rayna’s (emotionally charged) advice, and vows to pay for the medical costs of all the people injured at the concert. She also invites her mother and the counselor on tour with her. At the end of the episode, Deacon returns to the veterinary clinic to ask Stacey on a proper date and tells her he named his male dog Sue. A take on Johnny Cash’s song “A Boy Named Sue.” Of course, Stacey really doesn’t like country music, remember? She doesn’t get it (the music or Deacon’s reference). 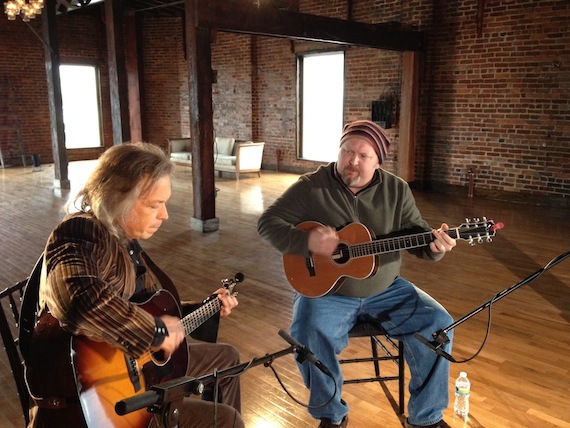 Songwriters Odie Blackmon and Jim Lauderdale wrote a song called “Tough All Over” that will be featured on “Nashville” this month. Pictured here, they also recorded an installment of On The Record for ABC’s website.